"We did it! We're breaking wind at ninety!" There has to be some reason one might want to own The Big Bus; perhaps to own a collection of all the movies that use nuclear power in the plot line. You know, The Atomic Café, The China Syndrome and this. Or perhaps, one might be collecting the films of Howard Hesseman. You know, Americathon, Doctor Detroit and this. Or perhaps a collection of all the disaster comedies. You know, Gas-s-s-s, Airplane! and this. The directing style, the actors and the cinematography of The Big Bus looks and feels like a film that was originally intended for a TV movie. But, with the popularity of the disaster films of the Seventies like Earthquake, Airport and The Towering Inferno, funds were found to expand to a big screen affair. Interestingly, the producer of The Big Bus is Julia "You'll Never Eat Lunch in this Town Again" Philips (with husband Mark), between her blockbuster jobs on The Sting and Close Encounters of the Third Kind. 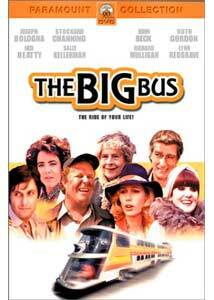 The Big Bus is an early big screen effort by veteran television director James Frawley, who also directed The Muppet Movie. The cast is populated by many familiar faces who are obviously having a high old time hamming up their scenes. Joseph Bologna as the suspected cannibal bus driver Dan Torrance is quite funny in that classic deadpan "boy on a burning deck" way. He takes over the task of driving the maiden run of the Cyclops, a giant nuclear-powered bus, from New York to Denver. At his side is co-driver "Shoulders" O'Brien, portrayed by John Beck, and one of the designers of the "big bus," Kitty Baxter (Stockard Channing). The passengers on the trip are a motley crew, including Rene Auberjonois as a troubled priest, Ruth Gordon as a crotchy old woman, Sally Kellerman and Richard Mulligan as a wacky couple, and Lynn Redgrave as an over-sexed socialite. Other bit players include TV veterans Larry Hagman (Dallas) as a very strange doctor in the parking lot, Vic Tayback (Alice) as a rival driver and Stuart Margolin (Rockford Files) as a bumbling terrorist. In the category of interesting character actors is Vito Scotti, who playes the barber on The Big Bus. He appeared in 1965's Von Ryan's Express as the Italian train engineer and showed up in 1972's The Godfather as Nazorine the Baker. Most parody films don't stand on their own because they rely on the audience recognition of the references in order to work. The Big Bus is better than that as one could certainly enjoy the humor of this film without ever having seen any of the big disaster films, but there are quite a few more specific referential gags that are funnier when the source is known. Unfortunately, overall the film is not that good; much of the humor is flat and for such a short film, there is a great deal of screen time taken up by scenes where nothing happens. The script would have probably been better off as a 90-minute TV movie with commercials than being "stretched" to a feature film at just under 90 minutes. This is really a one-joke film that features a big bus with a bowling alley and swimming pool and scant else beyond a few amusing bits. This comedy sits in the space where there are a few too many adult references to make it really appropriate as "children's entertainment." Older kids, perhaps ones that you catch watching Charlie's Angels or Mannix on TVLand might enjoy this romp. Or it can be used as a punishment, as in "If you don't do your homework, I'm going to make you watch The Big Bus again!" Image Transfer Review: It seems that many times, films from the 1970 suffer worse in the transfer to DVD. However, in the case of The Big Bus, they were probably able to find a print that didn't contain too much damage (probably from lack of play) and this picture looks pretty good in this anamorphic widescreen version. Very tacky and trashy in a Starsky and Hutch kind of way, the garish design of the bus is reproduced faithfully. Audio Transfer Review: Very surprisingly, this film contains not only a "restored" mono soundtrack but has been remixed into Dolby Digital 5.1 for this DVD. Both are very good and help the film avoid that tinny muffled quality that can really ruin the home theater experience. The 5.1 does a decent job of spreading the sound across the speakers. Additionally, there is a French mono track that makes for reasonably humorous viewing. Extras Review: Not a sliver of extra material. No trailer, no bios, no poor quality production stills, nothing. Hello! This is DVD! A good transfer of an iffy 88-minute film—looks like a bargain bin candidate to me. Still, The Big Bus is a must for Larry Hagman completists.